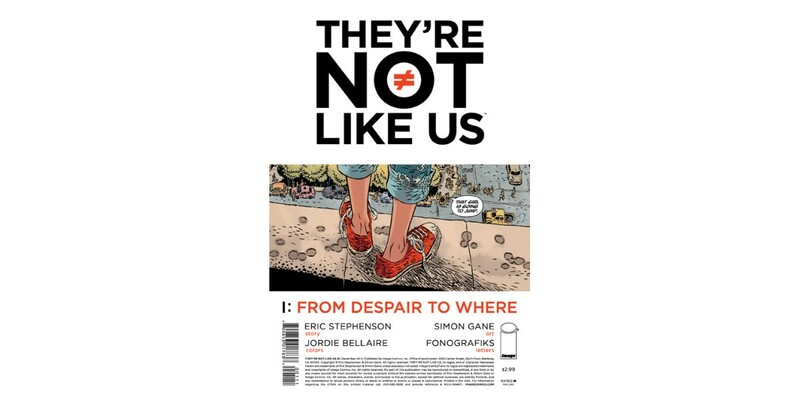 The newly launched THEY’RE NOT LIKE US series by Eisner-nominated writer and Image Comics Publisher Eric Stephenson (NOWHERE MEN) and artist Simon Gane (The Vinyl Underground, Paris) has been praised by critics and fans alike for its rapid pace and jaw-dropping cliffhanger. The first issue is slated for a second printing in order to meet growing customer demand. We all have advantages over one another, but what if the next generation of youth were capable of things most of us could only imagine? What would they do—and who would they be? A doctor? An athlete? A soldier? A hero? Since the beginning of time we’ve all had to make choices about how to use our own unique abilities, but not like this generation... THEY’RE NOT LIKE US. THEY’RE NOT LIKE US #1 remains available for purchase across all digital platforms, including the Image Comics website (imagecomics.com), the official Image Comics iOS app, Comixology’s website (comixology.com), iOS, Android, and Google Play. THEY’RE NOT LIKE US #1, 2nd printing arrives in stores on February 11 and can be pre-ordered with Diamond Code DEC148095. THEY’RE NOT LIKE US #2 hits stands on January 28 and can be ordered with Diamond Code NOV140691.